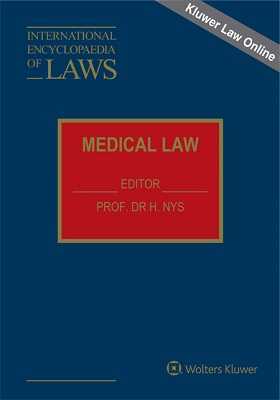 Relating to the practice of medicine in the large sense, this subset of the International Encyclopaedia of Laws covers national and international medical law. Each national monograph contains, besides a general introduction, a description for the country in question of: the law related to the medical profession, such as access to the medical profession, illegal practice of medicine and control over the practice of medicine. the physician-patient relationship (the rights and duties of physicians and patients) and specific issues such as abortion and euthanasia. And the national law dealing with the physician in relation to his colleagues, to other health care providers and the health care system. An international monograph covers the World Health Organization in both its international and regional aspects. A Codex of International Medical Law and Ethics is also included. Forthcoming international monographs will cover international declarations on medical ethics such as the Declaration of Helsinki on Medical Experiments (1964) and the European Code of Medical Ethics. The Authors. Table of Contents. Preface. Part I: The Medical Profession. 1. Access to the Medical Profession. 3. Illegal Practice of Medicine. 4. Control over the Practice of Medicine. Part II: The Physician-Patient Relationship. 2. The Physician-Patient Relationship in Specific Terms. Part III: The Physician and the Health Care System. 2. Relationship with Other Health Care Providers. 3. Relationship with Health Care Institutions. Curriculum Vitae of the Editor.